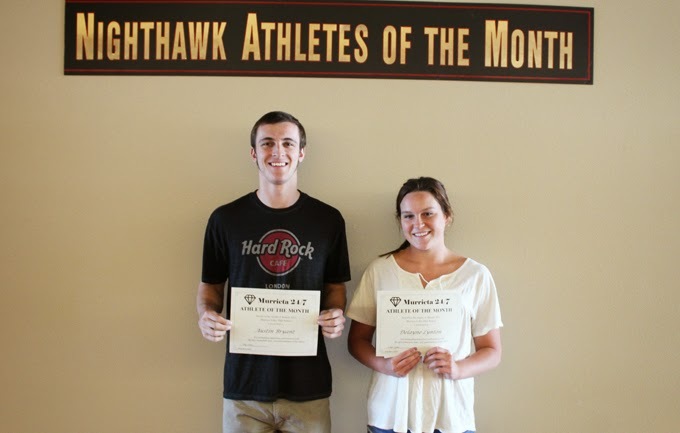 Boys basketball standout Austin Bryant and girls water polo star Delayne Lynton have been selected as the Murrieta 24/7 Athletes of the Month for January representing Murrieta Valley High School. Bryant, a senior center and power forward, is averaging 20.5 points and 9.3 rebounds per game for Murrieta Valley, which is 10-13 overall and 4-4 in the Southwestern League with two games remaining. The Nighthawks play at Temecula Valley tonight and host Great Oak on Friday, hoping to finish strong enough to make the CIF playoffs. Postseason tournament match-ups will be announced this weekend. "It's been a very big learning experience for everyone on the team," Bryant said. "As a whole, we're getting better every game. We're working hard and learning a lot about the mental aspect. "We're a fairly young team. Even the seniors don't necessarily have a ton of playing experience. But this is the last week of league, so we know if we take care of business, we're in the playoffs." Bryant said he would like to play basketball in college but is more focused on academics and his goal of becoming a civil engineer. "I would love to play college basketball, but if I have a better opportunity in academics, I will take that," he said. Lynton is a junior attacker for the Nighthawks girls water polo team, which is one of the top teams in the Southwestern League heading into the league finals later this week and CIF playoffs next week. The daughter of Nighthawks coach Bryan Lynton, Delayne has been playing water polo since the age of 5. When the high school season is over, she resumes play for her club team. "I've grown as an athlete more this season, being one of the older girls on the team and having to step forward a little bit," Lynton said. Dedication to her favorite sport has never wavered for Lynton, who works all year long to stay in shape. "I love to swim and I just really wanted to play water polo at an early age," she said. "I guess the hardest part is the conditioning, being able to swim for a long time. You need strong legs."